Ruth Rabbah (Hebrew: רות רבה) is an haggadic and homiletic interpretation of the Book of Ruth, which, like that of the four other scrolls ("megillot"), is included in the Midrash Rabbot. This midrash, divided into eight chapters or sections ("parashiyyot"), covers the whole text of the Biblical book, interpreting it verse by verse, now in its literal, now in an allegorical, sense. The first chapter terminates with Ruth i. 2; the second, with i. 17; the third, with i. 21; the fourth, with ii. 9; the fifth, with iii. 7; the sixth, with iii. 13; the seventh, with iv. 15; and the eighth, comprising only two verses, with iv. 19, verses 16 and 17 of ch. iv. being omitted. 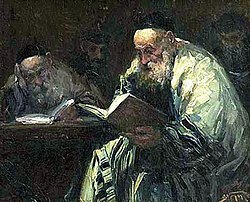 Like Ekah Rabbati, the commentary proper on the Book of Ruth is preceded by a long introduction (petiḥta), which consists of several proems having no connection with one another. The commentary itself, except in ch. i. and vii., where it follows directly upon the Biblical text, is generally introduced by one or more proems. It is composed in the spirit of the Palestinian haggadists, its main sources being the Jerusalem Talmud, Bereshit Rabbah, Wayiḳra Rabbah, and Ekah Rabbati. It would seem, moreover, that its author was opposed to the Babylonian Talmud; for in his interpretation of iv. 7—a passage which is omitted in the printed editions—he disparages that work. It is true that parallel passages are found in Shir ha-Shirim Rabbah, which this midrash closely resembles as regards arrangement and mode of interpretation, and in Ḳohelet Rabbah. But as to the former, nothing proves that it is anterior to Ruth Rabbah, while the latter is recognized by modern scholars to be posterior to this midrash. It apparently contains no Babylonian haggadot, and, although in i. 3 (= ii. 4) it gives the haggadic interpretation of I Chron. iv. 22, which is also found in B. B. 91b, it may be seen that the source in the latter treatise is a baraita and not a Babylonian haggadah. Thus Ruth Rabbah is one of the earlier midrashim, composed about the same time as or shortly after Shir ha-Shirim Rabbah. According to Zunz (G. V. ed. Brüll, p. 277, Frankfort-on-the-Main, 1892), Ruth Rabbah, as well as Shir ha-Shirim Rabbah and Ḳohelet Rabbah, was one of the sources of the Yelammedenu, Debarim Rabbah, Pesiḳta Rabbati, and Shemot Rabbah, being a medium between these midrashim and the older haggadah (comp., however, Friedmann, introduction to his edition of the Pesiḳta Rabbati, p. 25). Ruth Rabbah is specially interesting from a cultural-historical point of view in that it endeavors to throw light on the habits and conditions of the time in which the incidents of the Book of Ruth took place. Thus, interpreting the very first words of the book, "in the days when the judges judged" (Ruth i. 1), as "in the days when the people judged their judges," the author wishes to show that there was a time when the judges perverted their judgments so that they were held responsible by the people. But when was there such a time, and who were those judges? According to Rab, the judges were Barak and Deborah; according to R. Huna, Deborah, Barak, and Jael; and according to Joshua b. Levi, Ehud and Shamgar. The famine is circumstantially described; it was one of the ten great famines which afflicted the entire world. Elimelech is represented in an unfavorable light, his name being interpreted as meaning "one eager for royalty." He left the land of Canaan not because he would himself suffer from the famine, but because he was afraid that the people might apply to him for help. In interpreting i. 14, the author of this midrash expresses his views with regard to kissing. According to an anonymous authority, kisses are permitted on three occasions only: (1) on conferring a high office, as when Samuel kissed Saul (I Sam. x. 1); (2) at meetings, as in the case of Aaron kissing Moses (Ex. iv. 27); and (3) at parting, as when Orpah kissed her mother-in-law. According to R. Tanḥuma, kissing is permitted also to relatives, as when Jacob kissed Rachel (Gen. xxix. 11). Under other circumstances kissing is declared indecent. Very graphic is the description of Ruth's insistence on following Naomi (Ruth i. 16-18), in that, when her attention was directed by her mother-in-law to the laws relating to proselytes, she accepted them all. Both Naomi and Ruth are described as righteous women whose acts were charitable. The latter particularly is pointed out as being modest and of exemplary manners (ii. 5). In his interpretation of iii. 3 the author of the midrash shows the necessity of honoring the Sabbath by wearing special garments. It may be remarked that in iii. 13 there is a recension of the story of Elisha B. Abuyah, the main source of which is Ḥag. 14b. The midrash terminates with a statement to the effect that the Messiah is to descend from Ruth through David. With regard to lexical interpretations, in certain cases the explanation of words is not contrary to grammatical rules, but sometimes, as in all the other midrashim, the interpretation is arbitrary. Thus, while "Elimelech" is interpreted as composed of "elai" and "melek" (= "to me belongs royalty"; comp. above), "Naomi" as "she whose acts are agreeable," and "Orpah" (from "'oref"="the nape of the neck") as "she who turned her back [comp. Jer. ii. 27 and elsewhere] upon her mother-in-law," "Wa-yehi" is interpreted as an exclamation of sorrow; and "Ruth" (derived from ראה = "to see") as "she who saw or considered her mother-in-law's words." For commentaries on and editions of Ruth Rabbah see Ekah Rabbati, Esther Rabbah, and Ḳohelet Rabbah. Wünsche, Introduction to his German translation of Ruth Rabbah. Jewish Encyclopedia article for Ruth Rabbah, by Wilhelm Bacher and M. Seligsohn. This page was last edited on 17 December 2014, at 17:19 (UTC).